I'm not sure how many of you crochet but it has become my new obsession again. My grandmother taught me a long time ago, when I was in elementary school. Through the years, I've gone through cycles of crocheting where I do it non-stop and then don't do it again for years. Well, I started crocheting again when I got real sick a couple of months ago and couldn't do anything else. You know when I pretty much disappeared the last few months. I even ended up in the hospital but that is another story. 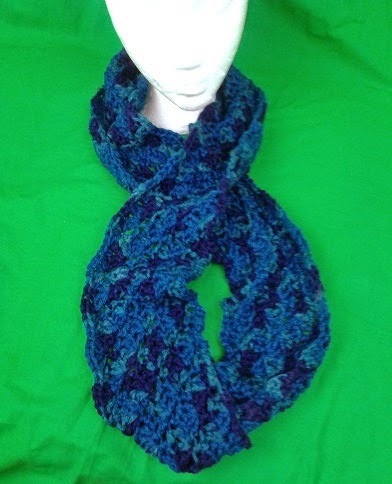 So, anyway, I designed this infinity scarf. 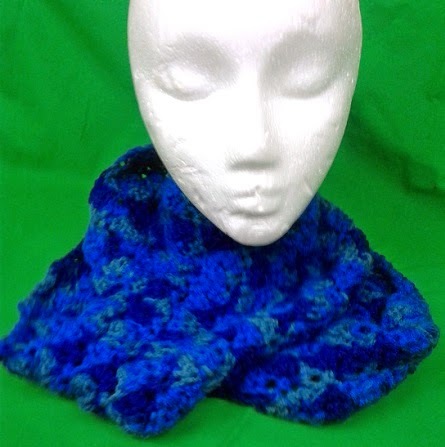 It is pretty easy and uses 3 different shell stitches. I hope you like it. Please let me know if you have any problems with the directions. This is my first time writing a pattern. I'd love to see your scarves, too. Here we go. Chain 180 (or any multiple of 6 for the size you want). Join with a slip stitch to the 1st chain. Make sure that you don't twist the chain when joining. Row 2: (ch. 3, DC, ch. 1, 2 DC in same stitch, sk. 2, HDC in ch.1 space, sk. 2, *Shell A in top of HDC, sk. 2, HDC in ch. 1 space, sk. 2* Repeat from * to * to end of round. Join with sl st in top of ch. 3, sl st in DC, sl st in ch 1 space. Row 3: ch 2 in ch 1 space, sk 2, Shell B (DC, ch 1, 3 DC) in top of HDC, sk 2 *HDC in ch. 1 sp, sk 2, Shell B in top of HDC, sk2* Repeat from * to * to end of round. Join with sl st in top of ch. 2 space. Row 4: (ch 4 (counts as DC, ch 1), DC, ch1, DC) in same stitch, sk 2, HDC in 2nd DC, sk 2, *Shell B (in HDC), sk 2, HDC (in 2nd DC), sk. 2*. Repeat from * to * to end of round. Join with sl st in 3rd ch of beginning ch 4, sl st in ch 1 space, and sl st, in DC. Row 5: Ch. 2, sk 2, Shell C (DC, ch 1, DC, ch 1, DC) in HDC, sk 2, *HDC (in 2nd DC), sk 2, Shell C (in HDC), sk. 2*. Repeat from * to * to end of round. Join with sl st in top of ch 2. Row 6: (ch. 4 (counts as DC, ch 1), 3DC) in same stitch, sk 2, HDC (in 2nd DC), sk 2 *Shell B (in top of HDC), sk 2, HDC (in 2nd DC), sk. 2. Repeat from * to * to end of round. Join with sl st in 3rd ch of ch 4, sl st in ch 1 sp, and sl st in DC. Row 7: Ch 2, sk 2, Shell A (in HDC), sk 2, *HDC (in 2nd DC), sk 2, Shell A (in HDC), sk 2*. Repeat from * to * to end of round. Join with sl st in top of ch 2. Row 8: (ch. 3, DC, ch 1, 2 DC) in same stitch, sk 2, HDC (in ch 1 space), sk 2, *Shell A (in HDC), sk 2, HDC (in ch 1 space), sk 2*. Repeat from * to * to end of round. Join with sl st in top of ch 3. Finish off and weave in ends. Please, please let me know if there are any mistakes or something is hard to understand. 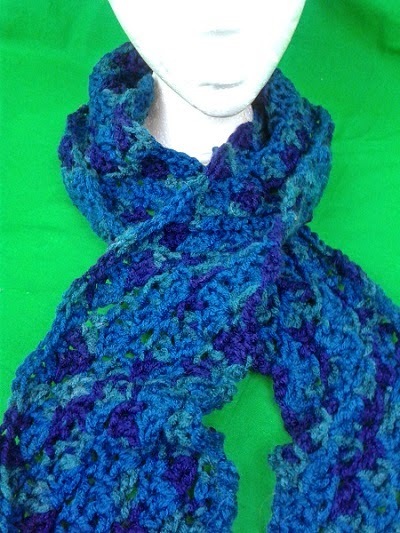 I will be posting a pattern for a hat that closely matches the scarf. I'm still tweaking it but I should have it done sometime this week.